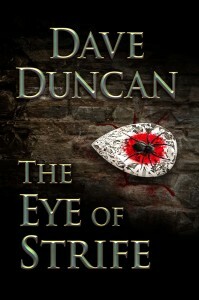 The Eye of Strife, Dave Duncan’s masterful sleuthing fantasy is now available as an audiobook through iTunes, Amazon, and Audible. Narrated by Anthony Lee, the tale of The Eye of Strife takes listeners, and readers, through sword fights and romance, miracles and mystery, treachery and sly humour. A god summons a curious assortment of witnesses to his temple to testify on what they know about a jewel that was lost 1,000 years ago. At least one of them is guilty. Others are lying…. Readers are recommending The Eye of Strife. As the narrator of this audiobook, I would like to thank Lorina for offering me this opportunity and Dave for writing an entertaining story. It is an honor to have recorded the audiobook for the two of you and for the audience at large.